Welcome to Sarajevo. We’ve arrived in Bosnia and Herzegovina (shorthand: BiH) with Solange and the kids, a little uncertain about what we’d find. It’s strange to think that the country was still at war 21 years ago – centred around whether Bosnia should stay in the Yugoslav Federation or become independent. Two million people (about half the population) were displaced by the end of it and the infrastructure and economy were in shreds. This morning we headed to Mostar, situated between Sarajevo and the Adriatic Sea. 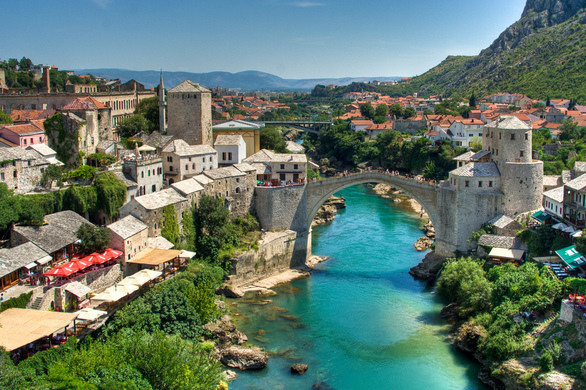 It’s a striking small city, filled with narrow alleys of shops and cafes and famous for its Stari Most (Old Bridge). The bridge was first built in the mid-1500s on the orders of Suleyman the Magnificent and was destroyed during a Croat artillery attack in 1993 (you can see it on video if you Google it). It has now been painstakingly rebuilt and is classified as a World Heritage Site. After wandering around the centre of Mostar and restraining the kids from buying too many things at the markets, we have arrived in Sarajevo. Despite lots of rebuilding, there’s still evidence of the war – bombed out buildings among intact ones. We’re planning to visit the Tunnel Museum first. This tunnel, dug by hand under the airport runway, became the city’s only access to the outside world during the 1992–95 siege, when Sarajevo was almost entirely surrounded by Serb forces. Just in case we feel we’re not seeing enough war-based ‘attractions’, we’ll be also paying a visit to the Latin Bridge, infamous site of the assassination 102 years ago of Austro-Hungarian Crown Prince Franz Ferdinand and his wife, Sophie, and which escalated into World War 1 (thanks to various European alliances). I’m really looking forward to trying all kinds of Bosnian delicacies, not least the coffee, which is served in individual, long neck copper pots called džezvas and accompanied by a piece of lokum (Turkish delight).